The Xiaomi Mi Mix series kickstarted the final wave in the pursuit for all-screen front panels and we can't wait to see how far the Chinese brand can push away those bezels in the next generation. And judging by the poster below, we have every reason to be hyped. 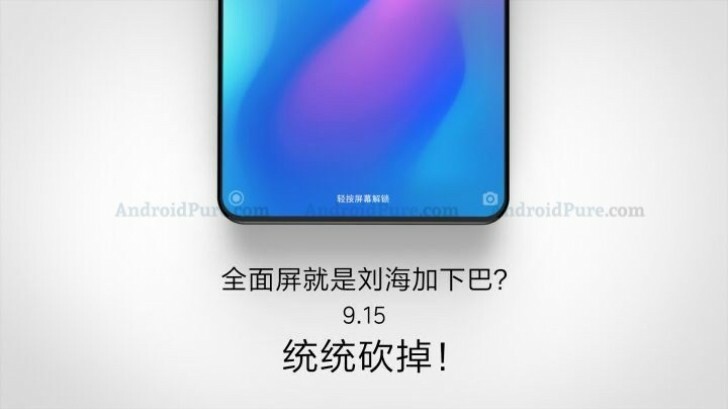 With the recently launched vivo NEX and Oppo Find X, the upcoming Mi Mix 3 will have a tough time competing with the impressive screen-to-body ratios. But with that thin lower chin, it might still stand a chance. Other important info that we could gather from the poster is the announcement date - September 15. It's in line with the first leaked poster pointing at September launch and periscope-style slider camera. If the top bezel is just as thin as the side ones and the chin, this is the only place the front-facing camera will have to go. Love your comments of a phone that you have never held and never used. And i also love the fact that Nokia is going rock again a phone that you have never held and never used.